Imagine investing in a vehicle wraps for you fleet only to find loose edges, alignment issues, even (horror!) cuts in the paint. Ouch! Quality sign installers and wrap experts know and understand today’s wide range of material properties in addition to the potential and limits to what they can do. These unsung super heroes of the sign industry have the skills and experience to install a variety of graphics on all types of surfaces, even around the complex curved surfaces of a race car. Never underestimate the value of proper installation! 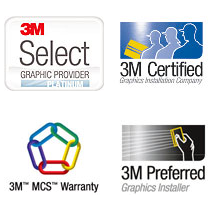 Auto Trim DESIGN uses 3M trained professional installers for any job, big or small. Your investment is just too important to leave to anyone else but the best!